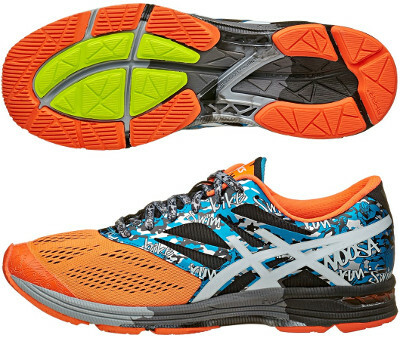 Asics Gel Noosa Tri 10 are stability performance running shoes. The Asics Gel Noosa Tri 10 is the fanciest model among not only performance running shoes with pronation support but the whole range available out there. Pretty popular for triathletes (soft, seamless lining inside let runners wear it sockless) and also as casual shoe, it shares platform with its popular relative the Asics Gel DS Trainer 20. Upper has been renewed from its predecessor the Asics Gel Noosa Tri 9 improving breathability around midfoot and changing forefoot's configuration for superior comfort. Lace system has been updated for better fit and it also accepts those elastic ones of regular use in trathlon for faster transition. Several reflective elements from 3M® have been added to enhance visibility under poor light conditions. Midsole uses DuoMax® dual density compound for pronation control and redesigned TPU unit (Propulsion Trusstic®) in the midfoot for enhanced response and gait efficiency. A lighter evolution of the Solyte® midsole delivers perfect blend of responsiveness and cushioning along with well known rear and forefoot GEL®. Outsole features AHAR placed in critical areas for exceptional durability and a special blend of organic and non-organic components, designed to improve traction even on wet surfaces.